Bollywood and fashion move on the same track in India. Every decade has fueled new trends, thanks to actresses whose on-screen avatars were worshipped then, and remain iconic even today. From the elegant Nargis of the 1950s to the present-day Deepika, we look at the evolution of Bollywood fashion down the ages. All you fashion freaks, better watch out... the best outfits hanging in your wardrobe could well be courtesy 'Bollywood'. Traditional ruled the Bollywood roost. 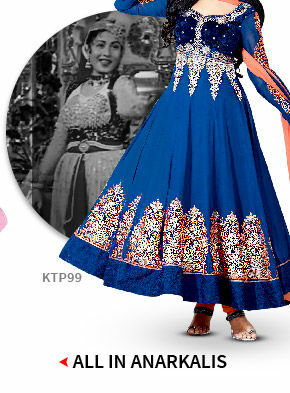 Madhubala's ornate Anarkali in the song Pyaar Kiya Toh Darna Kya in Mughal-E-Azam (1957) continues its reign. Sadhana, Asha Parekh and Sharmila Tagore brought figure hugging sleeveless churidar kurtas in the limelight. As Zeenat Aman swayed to the beats of 'Hare Rama Hare Krishna' in flared pants, the maverick hippie look came in. Remember the frenzy of fangirls for the polka dots that Dimple Kapada immortalised in her debut film, 'Bobby'? They were in fashion then, now and forever. Rekha's monotone silks in 'Silsila' in 1981 was an evergreen style statement. This decade also ushered in sheer fabrics such as chiffon. As Sridevi's gossamer saree in 'Chandni' and Mr India created a furore, women of all ages voted for the sensual look! The generally over-the-top Karishma Kapoor made a dressy mark in Raja Hindustani. But the decade truly belonged to ‘Dhak Dhak’ Madhuri who set the trend for wearing heavily embellished wedding outfits in ‘Hum Aapke Hain Kaun’. Filmi shaadis were in! 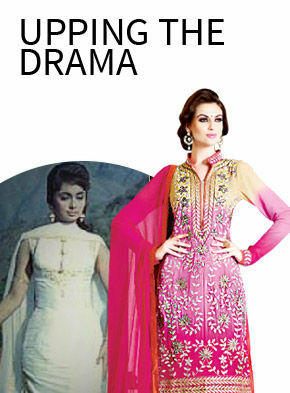 'Kabhi Khushi Kabhi Gham' brought in the trend of designer wear. Kareena Kapoor's outfit in Bole Chudiyan is memorable. For easy dressing, go the ‘Lakshya’ way. Remember Preity Zinta's bags, kurtis and long skirts? Alia Bhatt did it again in ‘2 States’ a decade later. We live in times when clothes belong to individual comfort zones. From Deepika's confident working girl look in 'Piku' to her exuberant Ramleela wardrobe of traditional 'ghagra cholis, this megastar reflects the attitude of today's woman. Anything goes!